Dreaming of visiting China? Don’t even think about leaving without spending at least one day in Shanghai! Although Shanghai is often overshadowed by the more obvious cultural treasures of Beijing, there’s a ton to keep travellers busy in China’s biggest city. Whether you’re mesmerized by the old colonial grace of The Bund, the space-age skyline of Lujiazui or the traditional Chinese flair of Yuyuan Garden, Shanghai checks off all the boxes for an unforgettable modern Chinese urban experience. So, you’ve set yourself up quite the challenge, eh? Visiting any city on a time-crunch is difficult. Even more so when that city is Shanghai. Over 24 million people call the Shanghai area home, and as you can imagine, that means that all of the best things to do in Shanghai are spread far and wide. 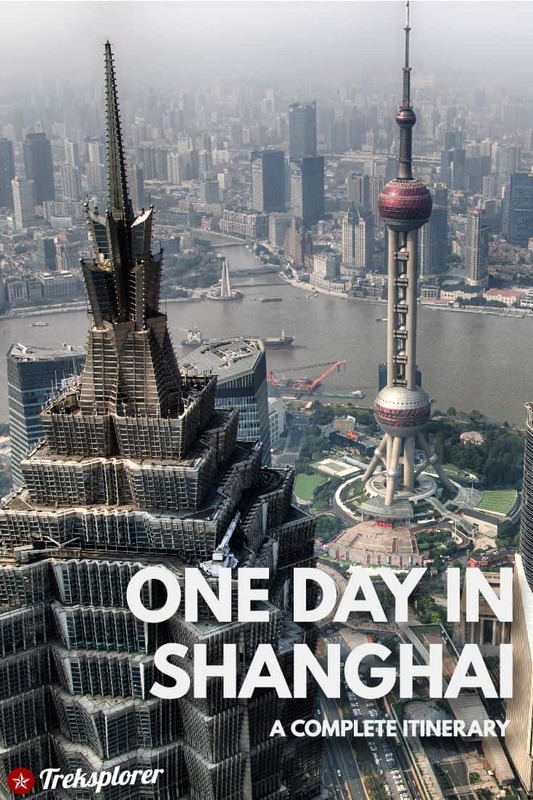 Even so, there’s a ton you can see in Shanghai in one day. Shanghai is a surprisingly walkable city, even if the courtesy of drivers isn’t quite what you’re used to. Reaching many of the top spots on this Shanghai itinerary by foot isn’t so hard if you’re willing to rack up a couple miles with your walking shoes. When all else fails, the trusty public transportation system in Shanghai steps in to save you time and energy. If you’re coming in from the airport, the Shanghai Maglev & Metro Pass is a great value giving you two one-way tickets to/from the airport on the speedy maglev train along with a 24-hour metro pass for just 85 yuan ($13.41). Preparing for your Shanghai itinerary? Don’t forget to protect yourself with travel insurance! I can hardly think of a more perfect place to start your first day in Shanghai than the city’s most iconic stretch, The Bund. Perched on the banks of the Huangpu River, this lovely boardwalk area (at least on the western side of the river) feels almost as much like China as London does. When major European powers settled in Shanghai after the Opium War, many opened up shop along The Bund, constructing their buildings in various major Western architecture styles. Along the stretch, get dazzled by everything from Gothic and Renaissance revivals to Art Deco and neoclassical. 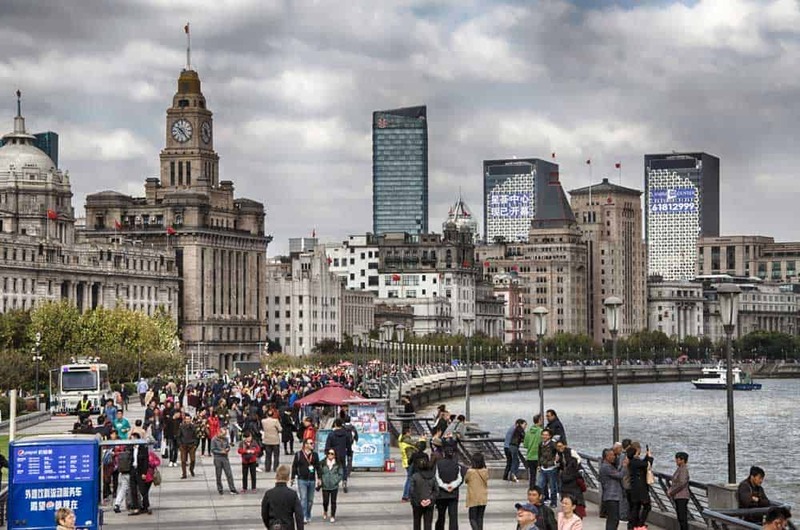 As you’d imagine, The Bund is one of the most popular gathering spot for tourists in Shanghai. Make it your first stop of the day and unwind a little to its marvelous architecture and views of the futuristic Lujiazui skyline across the river before the full-on tour group onslaught descends. Want to star off your day in Shanghai right? Check out some of these awesome day tours! 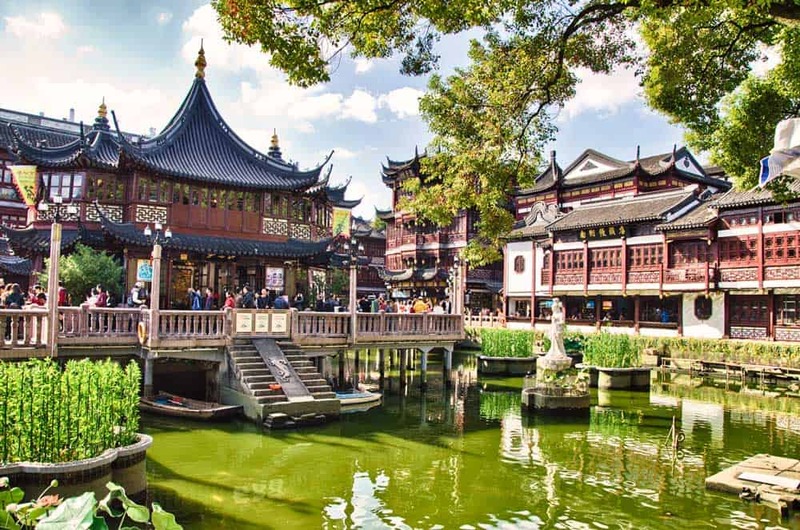 8-Hour Private City Tour: Explore Shanghai to its fullest on a time-crunch with this action-packed full-day that take in all the top sightseeing highlights from Yuyuan Garden to Xintiandi to The Bund. Shanghai Must-Sees & Foodie Bike Tour: A 4-hour bike tour that hits up many of the city centre’s highlights including The Bund, Yuyuan Garden, and The French Concession as well as hidden gems that most tourists on a walking tour would miss out on. Bund & Breakfast Tour: An in-depth morning tour of The Bund and the surrounding area including a tasting of typical local breakfast foods on Nanjing Road on route to The People’s Square. Near the northern fringes of The Bund, cross over the busy Zhongshan East Road to Nanjing Road. 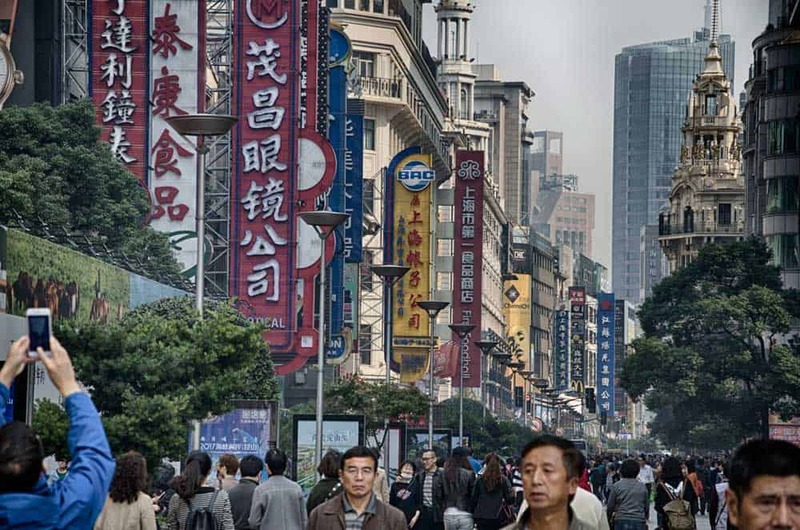 This eastern stretch of Nanjing Road between the river and People’s Square is Shanghai’s premier spot for shopping, featuring everything from upscale boutique stores and chain restaurants to large department stores and small local shops. Shanghai No. 1 Department Store: A large state-owed department store that sells nearly everything under the sun from cosmetics to fashions. Hugely popular with Shanghainese locals. Heng Da Li Clocks and Watches: A popular historical shop, ticking since 1864, that sells high-end watches and clocks. Cai Tong De Pharmacy: A huge four-floor pharmacy that’s been dispensing traditional Chinese herbs & medicines since 1882. Shanghai Landmark: A massive ten-storey department store with more than 80 shops and restaurants spread over 25,000 square metres. Want to experience more of Nanjing Road & Shanghai with new friends? Book yourself onto one of these awesome tours! Shanghai Highlights Old and New: Spend the day exploring all of Shanghai’s highlights from The Bund & Nanjing Road to Yuyuan Garden & Jade Buddha Temple on this private 8-hour excursion. Shanghai Shopping Tour: If it’s retail therapy you’re after, then get cured with this 4-hour walking tour along Nanjing Road and Huaihai Road where you’ll sift through boutiques and department stores featuring all your favourite brands. Private City Day Tour: A value-laden fully-customizable day tour that puts all the city centre’s top attractions at your fingertips. Hotel pick-up and drop-off is included. Saunter over to the western edge of Nanjing Pedestrian Road to hobble into the heart of central Shanghai, People’s Square. Although not necessarily a must-see on its own, People’s Square is a great place to walk around and put your finger on the pulse of Shanghai. The northern half of the square closest to Nanjing Road, the small city centre oasis of People’s Park stands in contrast to the megacity vibe around it. Even though it still feels firmly entrenched in the downtown buzz, it’s a pleasant escape into some relaxing greenery amid the chaos of Shanghai. Further south is People’s Square itself, showing off Shanghai’s modern face around its sprawling open space. Fans of Chinese history should not miss a chance to visit the Shanghai Museum, located on the southern edge of the square. It features eleven galleries and three exhibition halls of ancient Chinese paintings, ceramics, calligraphy, and artifacts. With just one day in Shanghai, you won’t have time to peruse everything at Shanghai Museum. If museums are your thing (and you rose to the occasion early enough), poke your head in and check out a couple of the more interesting exhibitions like The Gallery of Chinese Ancient Sculptures and the Ancient Jade section. Built up an appetite for the ages? Return north through People’s Park and follow your nose to one of Shanghai’s best food streets, Huanghe Road. Shooting north from the Nanjing West Road and Jiujiang Road, this three-block stretch is home to some of the best restaurants in Shanghai serving everything from Shanghai’s famous xiaolongbao to fiery dishes from Szechwan. Jia Jia Tang Bao: One Shanghai’s premier destinations for silky & succulent xiaolongbao. The pork and crab dumplings are some of the tastiest you’ll find anywhere in the city and well worth the wait. 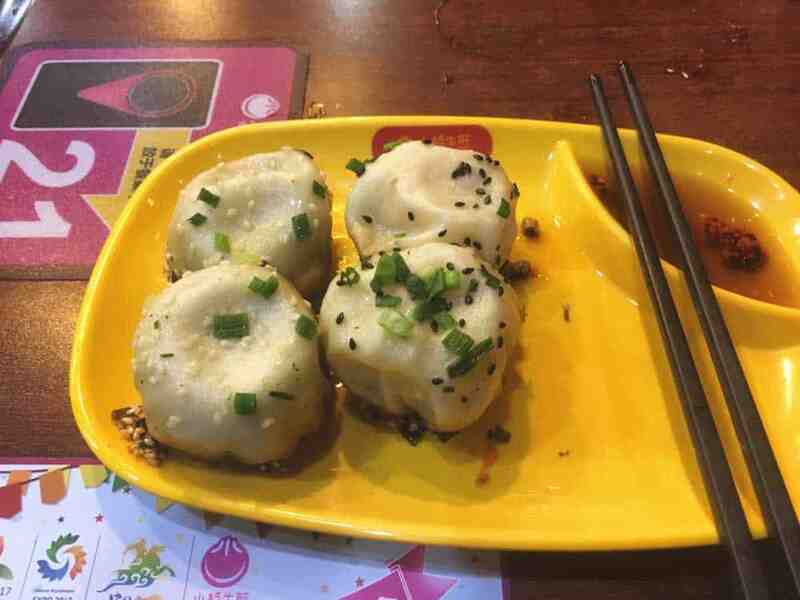 Yang’s Fried Dumplings: An insanely popular Shanghai institution serving up decadent shengjianbao, a soup dumpling much like xiaolongbao only fried instead of steamed. Chongqing Ming Fu Hotpot: A scorching alternative for lovers of flavourful spicy food. Serves up blazing hotpots inspired by the city of Chongqing in Sichuan. Mouth watering at the thought of all these Shanghainese delights? Discover more on one of these top-rated Shanghai food tours! Authentic Local Food Tour: Get out all your cravings on this amazing 3-hour culinary extravaganza. Taste popular local dishes like scallion oil noodles, steamed buns, soup dumplings, and hand-pulled beef noodles on Yunnan Road, one of Shanghai’s best food streets. Local Food Tasting Tour: Another 3-hour food tour focused on the Xintiandi area in the French Concession and Yunnan Road. Sampled dishes include parched chicken, red-braised pork, scallion oil noodles, and Longjing green tea. Chinese Cooking Class: Can’t get enough of Shanghai’s incredible cuisine? Learn to make it yourself with this intimate cooking class held in a local’s home! The class includes a visit to wet market where you’ll pick out the best authentic ingredients for the 2-3 local dishes you’ll learn how to cook. From Huanghe Road, walk back south to People’s Square Station and hop onto Subway Line 2 for the two-stop ride under the Huangpu River to Lujiazui. The centre of Shanghai’s financial industry, this vertically-gifted district in Pudong is where the city’s modern façade comes to the fore. Compared to much of Shanghai, Lujiazui feels a tad staler and less lively at street level—it is mostly a business district after all. Nonetheless, scoping out the feats of modern Chinese architecture that form one of the world’s most spectacular skylines up close is an experience that everyone should have—even if you’re only in Shanghai for a day! Besides housing the country’s most important companies and some of the best luxury hotels in Shanghai, visiting Lujizui is a must for one thing: seeing Shanghai from above. Shanghai Tower: The second-tallest building in the world featuring a vertiginous 118-floor observation deck. 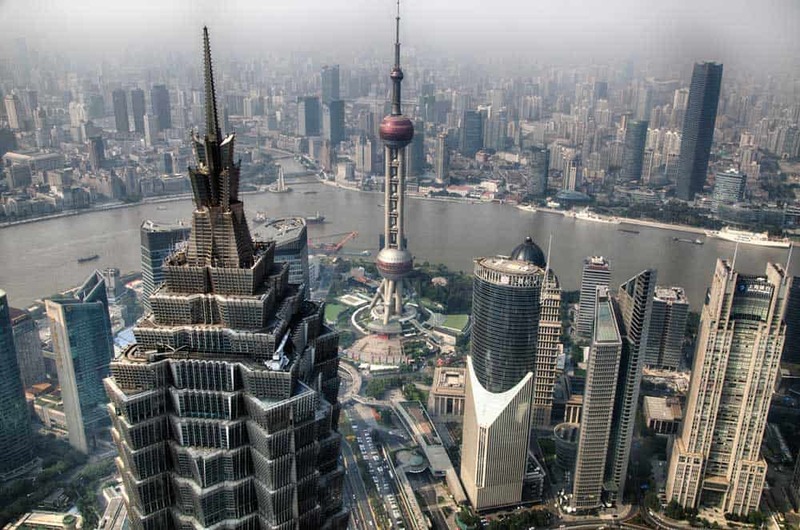 Skip the line and get your Shanghai Tower Observation Deck Ticket before you arrive. Shanghai World Financial Center: The second-highest observation deck in Shanghai, topping out at the 100th floor. Features three glass walkways on the 97th-floor to hover over Shanghai. 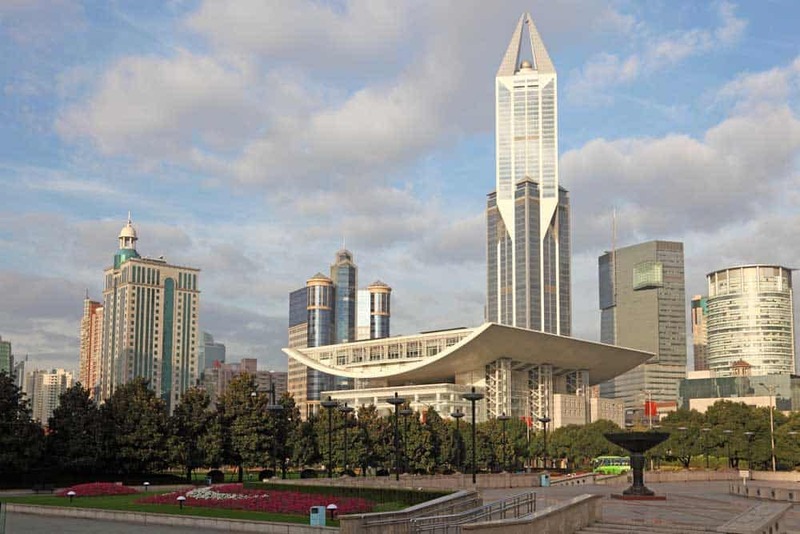 Get your Shanghai World Financial Center Observation Deck Ticket, including all three deck levels (94F, 97F, 100F), before you leave to skip the line and save. Jin Mao Tower: Topping out at the 88th floor, the observation deck of Jin Mao Tower is impressive—even if it’s ever-so-slightly vertically-challenged compared to its neighbours. Oriental Pearl Tower: Once the crown-jewel of Shanghai’s observations, Oriental Pearl Tower has fallen a little out of a vogue with the post-millennium boom of Lujiazui. Book your Oriental Pearl Tower Ticket with an evening buffet dinner at the tower’s Revolving Restaurant for something extra special. From Lujiazui, it’s about a 20-minute ride on the metro to Yuyuan Garden Station where the beautiful Old City of Shanghai starts to unfold. When you’re crafting your first China itinerary, the ageless graces of Shanghai’s Old City stimulate exactly as expected. Although it’s slowly transformed over the centuries from an ancient walled town into a hodgepodge of authentic old buildings and kitschy reconstructed ones (along with a few modern anomalies), Old City is the easiest place in the city to get a feel for Shanghai’s past. City God Temple: The most impressive temple in Shanghai Old City and the unofficial heart of the district. Costs 10 yuan to enter. Old Street: The bustling historic shopping district around Yuyuan Garden. Even if it’s (more than a little touristy, the narrow pedestrian-only alleyways, lined with food stalls and small boutique shops, are an interesting detour from the big city life outside. Huxinting Teahouse: The most famous teahouse in Old City. Perched upon stilts over a pond at Yuyuan Garden, this Shanghai favourite serves up fine Chinese green, oolong, black, and white teas with impressive views to boot. Yuyuan Garden: The crown jewel of the Old City. Designed during the Ming Dynasty, this spectacular park stretches out over 5 acres in the centre of the city. Wallow inside to find inner peace among the lush greenery and ponds peppered with halls, pavilions, and rock gardens. Entrance to Yuyuan Garden is 10 yuan. Want to learn a little more about Shanghai’s Old City? Join in on one of these informative tours! Shanghai Half-Day Tour: Explore the city centre including visits to The Bund, Yu Garden, Shanghai Old Street, and Xintiandi in the former French Concession on this 4-hour tour. Old Shanghai City Tour: Watch the present & past collide on this tour of the Old City and trendy Xintiandi where you’ll move between local markets and boutiques. 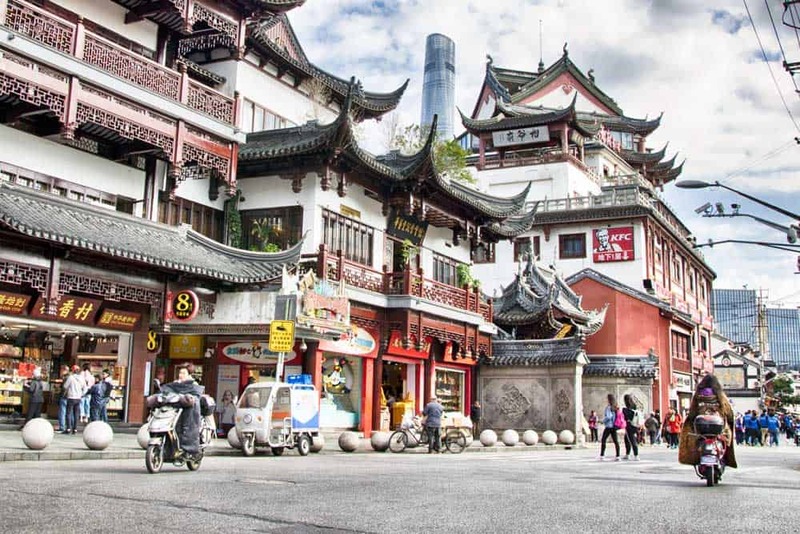 Old Shanghai Walking Tour: Get to know the Old City with help from a local on this 4-hour walking tour through top attractions like The Bund, Yuyuan Garden and Xintiandi. Excursion includes a visit to traditional teahouse for an authentic Chinese tea ceremony. Private Old City Walking Tour: Discover the less touristy side of Old City with this 2-hour private walking tour through its lesser-known nooks & crannies. Flex your Shanghai Metro Pass yet again to gear up for the short two-stop ride from Yuyuan Garden Station to Xintiandi. Located in Shanghai’s Former French Concession, this trendy neighbourhood harkens a vibe of the city’s roaring 1920s where restored shikumen (stone houses) now hide fashionable boutiques, shops, bars, cafés, and restaurants. Simply Thai: A trendy restaurant serving up perennial Thai favourites like tom yum, Massaman beef curry, and green chicken curry. Din Tai Fung: A favourite Shanghai-style xiaolongbao chain, that, ironically enough, hails from Taiwan. Like pretty much all of their locations around the world, this one in Xintiandi will keep you returning for more. Jardin de Jade: A classy Shanghainese restaurant boasting a coveted Michelin star. Makes for a splurge-worthy upscale Chinese dining experience while in Xintiandi. Aniseed Saigon: A Vietnamese restaurant serving up delicious popular Vietnamese dishes like pho, spring rolls, and bo bun. Ready to get into Xintiandi & the Old French Concession? Don’t miss a chance to hop onto one of these great tours! Yuyuan, French Concession, Tianzifang and The Bund Bus Tour: Get a wide appreciation of Shanghai with the full-day tour circling around much of the city centre. 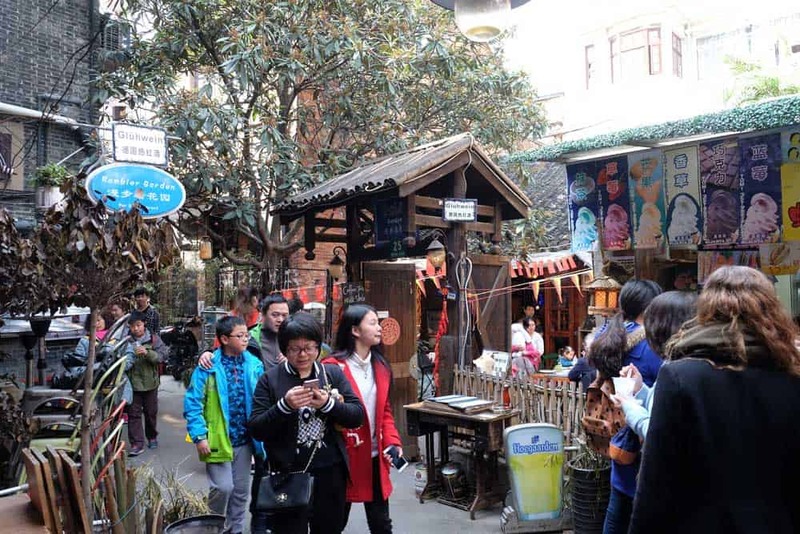 Aside from the usual highlights, the tour includes a visit to Tianzifang, a cool artistic enclave in the French Concession that gives an idea of the city at the turn of the century. French Concession Walking Tour: Stroll through the loveliest area of the city while discovering lesser-known stories about its past on this history-rich 2-hour walking tour. Shanghai Museum and Xintiandi District: Combine a visit to the massive Shanghai Museum and the cool Xintiandi area on this 5-hour tour. As much as I normally hate backtracking (you’ll soon thank me! ), pop back onto the Shanghai metro after a relaxing dinner in Xintiandi to return to Nanjing East Road. Head east back to The Bund to catch a glimpse of the wonderful light show humming across the Huangpu River. Captain’s Bar: Looking for a view on a budget? While it’s not as cheap as it once was, this hotspot for travellers, located above a popular hostel, offers incredible evening vistas over the The Bund and of the Lujiazui skyline with good company. Char Bar: The rooftop terrace of the Hotel Indigo on the Bund, this classy bar and steakhouse doles out some of the best nighttime views in Shanghai. VUE Bar: An upscale bar above Hyatt on the Bund Shanghai, takes its 360-degree vistas up a notch with its famous luxurious hot tub. Non-guests can expect to pay a (fairly reasonable) cover charge of 100 yuan, which includes a welcome drink. Bar Rouge: The most famous club in Shanghai, this trendy hotspot unleashes insane views of the Pudong skyline like none other. Unlike the other bars on this list, the dress code at Bar Rouge is fairly strict. Dress well if you want to get in. Ready to make the most out of the evening? Join in on one of these fantastic Shanghai night tours! Nightlife Adventure & Tasting Bike Tour: See Shanghai glowing at its finest as you zip through the streets on this 4-hour food & drink tour. Visits include one of the world’s most famous jazz bars and the hip nightlife district of Xintiandi. Private Night Walking Tour: Watch the city light up as only it can on this dazzling 3-hour evening tour of Shanghai. The excursion includes a free ticket to the observation deck at Shanghai Tower, one of the tallest buildings in the world, to see the skyline fully lit up from above. Late Night French Concession Food Tour: Got the munchies? Discover the best after-dark foods in the city on this walking tour through the French Concession. Dishes to sample include lamb kebabs, beef skewers, braised pork belly, and hand-pulled Uyghur noodles. Like any big city in Asia, nailing down where to stay in Shanghai isn’t always easy. Whether you’re in the air or even just travelling across the city, the immensity of this megapolis is instantly obvious. Campanile Shanghai Bund Hotel: An excellent 3-star hotel featuring modern rooms with trendy designs and furnishings. Located within walking distance to The Bund, Yuyuan Garden, and Shanghai Old Street. Shanghai Marriott Hotel City Centre: A sleek modern hotel that’s perfectly situated in the city centre near Nanjing East Road for shopaholics and culture-lovers alike. Rooms feature stunning skyline views through large picture windows. Get the best price and collect Marriott Rewards on your stay by booking directly at Marriott.com. The Peninsula Shanghai: One of the best luxury hotels in Shanghai. Located on The Bund, this classy 5-star hotel pulls out all the stops to deliver a world-class accommodations experience from its palatial indoor pool and relaxing spa to its stylish rooftop bar and city-view rooms. Shanghai Old and New Full-Day Tour: Discover Shanghai’s dueling ancient and modern faces on this full-day 8-hour introduction to the city. Join a professional private guide who’ll scoot you through the sights & stories of central Shanghai’s top attractions including The French Concession, The Bund, Yu Garden, and Jade Buddha Temple. 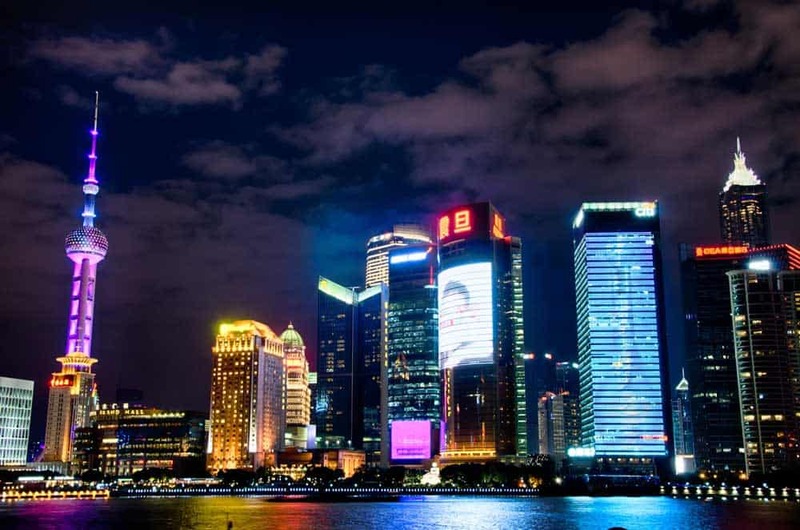 Shanghai Night River Cruise Tour: See the Shanghai skyline at its best on a relaxing evening cruise along the Huangpu River. Tour includes a tasty Xinjiang dinner, a Chinese cooking style inspired by its Silk Road roots. Authentic Local Food Tour in Central Shanghai: Taste the best Shanghainese cuisine in the city on this 3-hour evening culinary tour. Sample dishes include xiaolongbao, scallion oil noodles, and red-braised pork. Shanghai Night Food Tour: Go beyond the usual Shanghainese favourites with this off-the-beaten path culinary tour. At least 15 regional dishes from all around China are sampled, ranging between everything from the grilled lamb & naan of Xinjiang to the spicy dishes of Sichuan. Most international flights to Shanghai are served by Shanghai Pudong International Airport (PVG). As Shanghai’s a major hub in East Asia, flights here are often relatively cheap from many international cities—even compared to popular destinations like Tokyo. Looking for the best airfares to Shanghai? I’d recommend search for flight deals on CheapOair! It’s my new go-to flight search engine as it ALWAYS seems to uncover slightly better fares than other OTAs like Skyscanner or Kayak. Want more of the hip scene at Xintiandi? Try to squeeze in a visit to nearby Tianzifang, another cool & buzzing French Concession neighbourhood loaded with food stalls, art galleries, and small boutique shops. Taking the scenic route through the shady tree-lined boulevards and Fuxing Park is half the fun. Can’t get enough of ancient China? 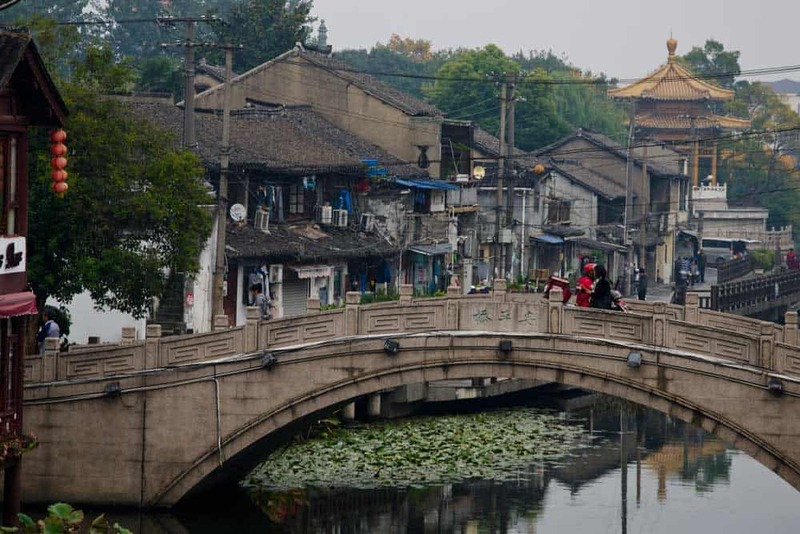 Skip out on Xintiandi and beeline to Qibao Ancient Town. While still firmly in the city (it’s just a 30-minute subway ride), Qibao is the closest water town to Shanghai and a great addition to any Shanghai itinerary. Still got an appetite? Venture off to Nanjing West Road Station and let your tastebuds explore the delicious delicacies of Wujiang Road, one of the best food streets in Shanghai. Like this article? Share it & pin for later!